Thank you for visiting Kalapuya Weaving! Enjoy your visit! ɬaxayam! My name is Stephanie and I'm the owner of Kalapuya Weaving. Throughout my personal life and educational career I've decided to create a small business where I teach basket weaving classes to private and public venues, work with museums and Tribal museums on artifact conservation, producing museum quality basketry replicas, cultural education, presentations, continuing the traditions of my Grandmothers and family before me. I want to help educate and pass on my knowledge to others. Basket weaving has been passed down in our family for 7 generations. My great great great Grandma Martha Jane Sands (Takelma Rogue River; 2nd from right in photograph). She was forcibly marched from her homelands in Southern Oregon along the Rogue River, at the age of 14, to her new home on the Grand Ronde Reservation in Northwestern Oregon located in the foothills of the Coast Range. She passed this cultural tradition on to her daughter Hattie Sands Hudson. 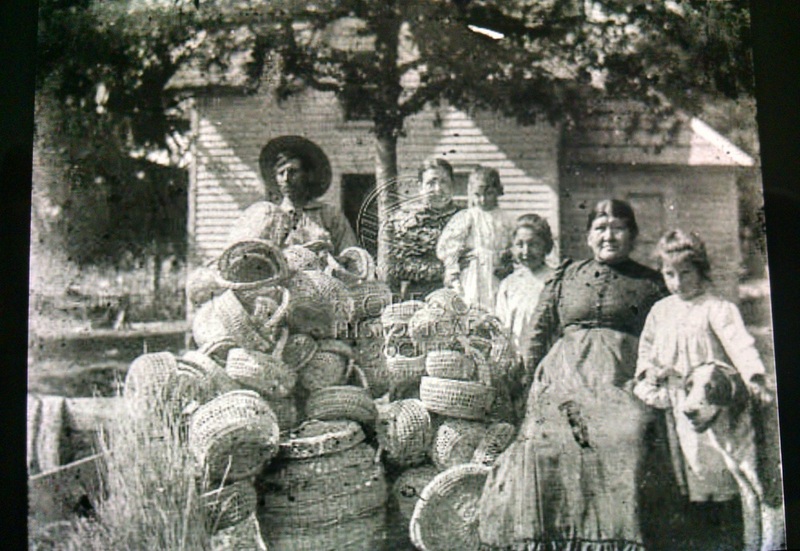 These women continued to weave Hazel Stick Baskets and sold them throughout the area to neighbors, friends, Native American basket collectors, tourism and settlers.